This chapter demonstrates the continuing relevance of Aristotle’s work on rhetoric to show how across both ‘talk’ and ‘texts’ many of the themes and devices Aristotle identifies are still relevant in understanding contemporary attempts to persuade. Rhetoric can be identified and analysed in two media: talk and texts. Under the general topic of ‘talk’ this is illustrated by the analysis of political speeches. Under ‘texts’ the chapter looks at documents setting out policy. 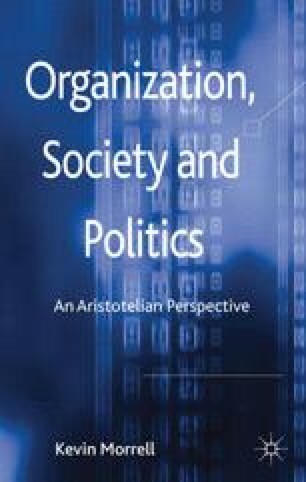 One way we can recapture Aristotle’s sense of interdisciplinarity in the study of politics and of contemporary organizations is through examining rhetoric. This is a phenomenon where, notwithstanding advances in our understanding of language, the most ancient and influential writings on the subject sit quite comfortably beside recent research.